After a short delay, Epic Games has released the v6.21 patch notes this morning for Fortnite Season 6. The Fortnitemares battle royale challenges continue until November 4 at 1 PM Eastern Time, which is 6 pm here in the UK. You’ll need to finish your Fortnitemares Challenges by then to unlock the Dark Engine Glider and be in-match at that time to witness the event. 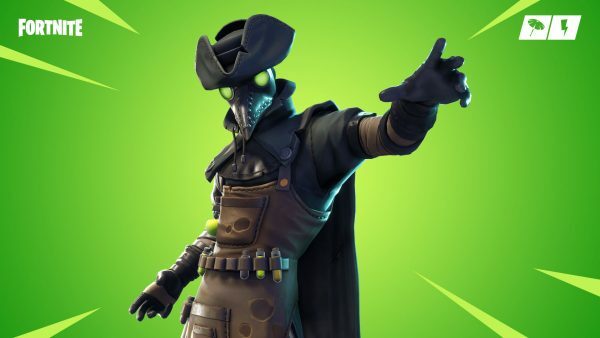 There’s also a new hero in Save the World, Dim Mak Igor the Plague Doctor Ninja who is now available. His ability description is: “Throw Smoke Bombs at enemy Husks while you resist damage with Shadow Stance. Trust him, he’s a doctor”. The Glider re-deploy function is still active, with a few changes being made in regard to its functionality, and will. Epic Games has stated it will “be prioritizing Glider audio over weapon audio within certain ranges, this will begin in v6.21. We also plan on adding additional changes in future updates” so expect the function to be around for a little longer. Epic rarity. Comes with 20 deployable balloons. Grappling as a vehicle passenger will now cause the vehicle to travel in a straight line to its destination rather than travelling in an arc. A few weapons have also been vaulted, including the Semi-Auto Sniper, Guided Missilea and Dual Pistols. Dim Mak Igor – Plague Doctor Ninja. Available on October 31 at 8 PM Eastern Time. Bug Fixes – Goin’ Commando’s perk Boomstick now properly deals energy damage.